Home Essence Lips Lipstick Review | Essence Longlasting Lipstick + Swatches (10 colours)! 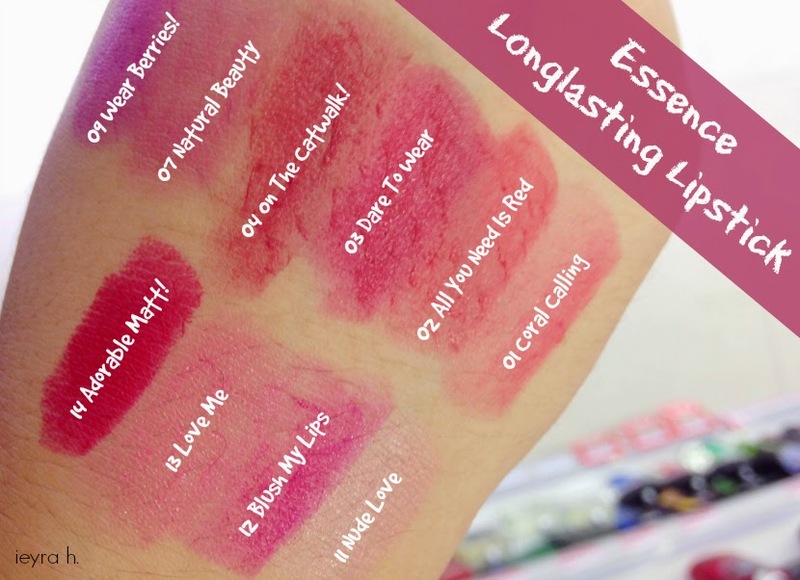 Review | Essence Longlasting Lipstick + Swatches (10 colours)! Yo, I've got another Essence product post for you!.....with more to come. I still couldn't believe my previous post was my very first 'in depth' review on this brand when I do actually have a lot of their products. I find myself buying makeup from Essence way more often than any other brands available in the nearest pharmacy. Their prices are extremely affordable and I'm constantly impressed by most of their products. Unlike the previous lip glosses that I ended up not liking, this brand new launched lipstick from Essence is something I'd consider buying more of the shades. It is none other than the Essence Longlasting Lipstick. Priced at RM12.90 each, how could I possibly resist? It's so cheap that it would be rude not to buy! Essence Longlasting Lipstick comes in a black-matte, plastic packaging. 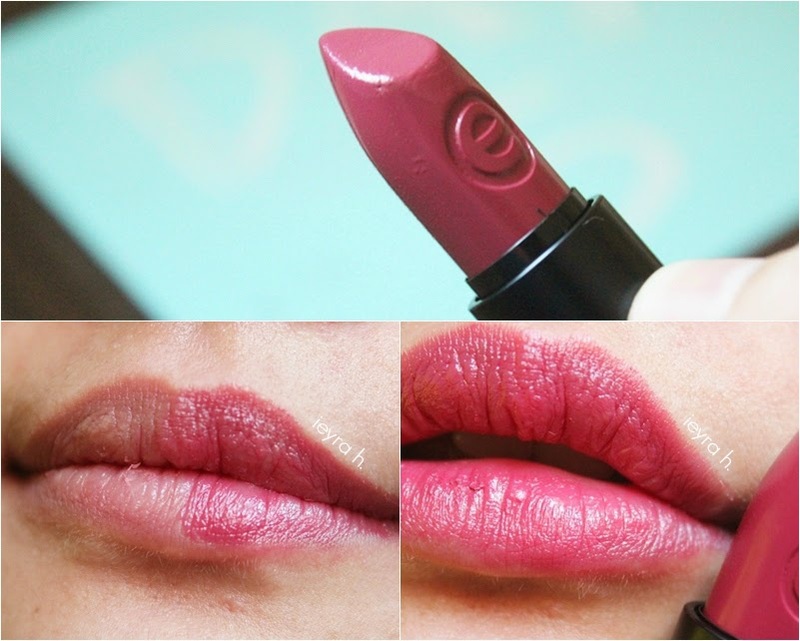 Although the lipstick feels sturdy, it has a chubby look and to some it might be bulky to carry around. I love how Essence engraved an 'E' letter onto the lipstick, it's cute and very much representative for the brand. Very Sweet, but it's hard for me to identify what the smell is like. Berries sweet? or more like candies? All I know it's definitely a scent where you feel like you want to lick it lol. Even Essie Button said so in her recent March favourite video. To be honest, I wasn't feeling this lipstick when it first came out. I swatched all of the colours in store and I was like 'meh' because the formula reminded me of the Revlon Lip Butter except that the latter is much more balmy. However, this line from Essence has been a huge hit over the internet so I insisted to give it a try. I ended up walking out of the store with 2 lipsticks; 04 On The Catwalk and 07 Natural Beauty. Upon swatches, I feel like most of colours look sheer upon hand swatches as well as on the lips. After using it for quite some times, I can definitely can see why people are raving about it! The finishing~ and the feel~ It's very light, moisturising, non-sticky and glides on the lips smoothly without any tugging. 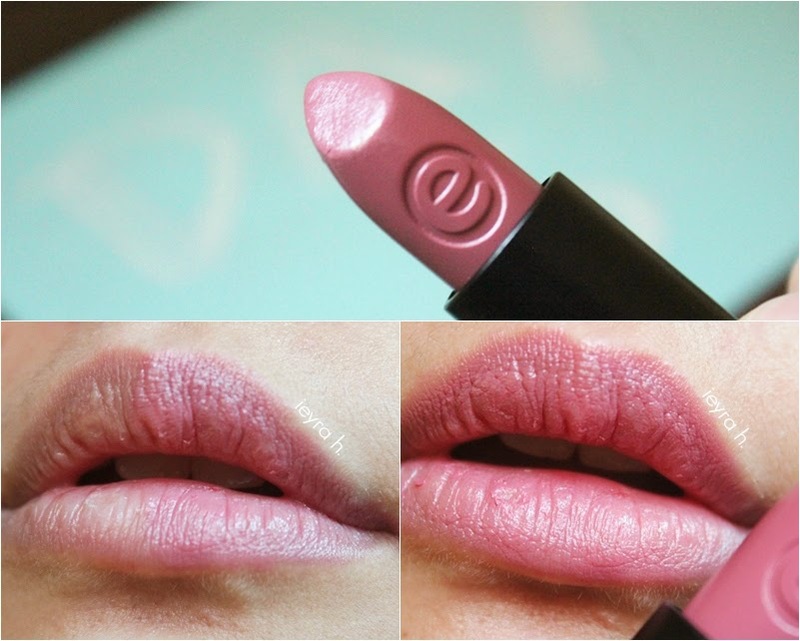 If you're someone who prefer moisturizing lipstick over lasting power, then this Essence lipstick is meant for you! as I don't think it's longlasting as the name suggests. It's also transferable, so it barely survive a meal or a drink. As you can see, they are mainly in pink and red with different hues. 14 Adorable Matt is opaque upon one swatch and I believe the best selling shade is 01 Coral Calling. I'd describe this as a berry red shade. The colour is very pretty, complements warm skin tone very well. I did not have anything similar in my stash so this lipstick is unique to me. It has a sheer coverage but can become intense after several layers. I managed to wear the lipstick for a good 3 hours before it faded out as a tint. If you want to wear a red lipstick but still not confident enough, then I'd suggest you to pick up this colour. People describe this as a nice MLBB lipstick colour, but as you can see from the swatch below, it appears to be more pink than my actual lips colour. Pink is not a shade that I'd typically go for when buying a lipstick. I look weird with it. The shade still appears to be natural so I think it's good for everyday use. Lasted on me around 2-3 hours of application. Omits its lasting power, I generally impressed with Essence Longlasting lipstick and thinking of purchasing more (especially 01 Coral Calling). It's AFFORDABLE, like extremely affordable and for something at this price point, I'd say the lipstick performs pretty phenomenal! I've heard so many good things about that brand, yet I haven't bought any of it. Those colors are really beautiful. I want the adorable matt one! I want their lip liners, bronzers, powders, blushes as well. too bad I can't find any essence's outlet anymore here, I've heard they've pulled out all essence product from Indonesia. After only been going on for a year. It's ridiculous.